Length: 3.10 m (121 inches). Width: 1.64 m (64 inches). Height: 2.30 m (90 inches). Weight: 3.225 kg (7.095 lb.). 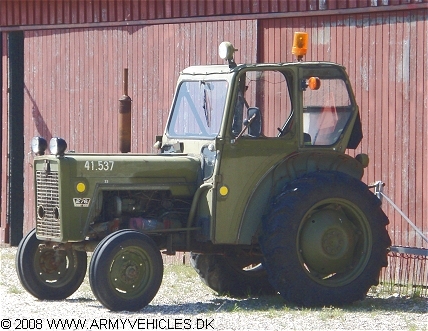 Engine: Own 4-cylinder, type BD144A, 2.360 cm3 (144 cubic inches) displacement, liquid cooled. Horsepower: 37 at 1.875 rpm. Electrical system: 12 volt, positive ground. Brakes: Mechanical (rear wheels only). Tyres: 5.50 - 16 (Front), 11.0 x 28 (Rear). Fuel capacity: 48 liter (10 gallons).